One of the features of the early days of this website was the fact that there were regular replies/comments suggesting that wages and earnings would continue to be a problem for some time. I doff my cap to those who first suggested it as it has become a theme of the credit crunch era. This means that your unofficial Forward Guidance was vastly more accurate and useful than those paid to do it. Here is an example from back then (Summer 2010) from the grandly named Office for Budget Responsibility or OBR. That to borrow from Star Wars seems like something from “A long time ago in a galaxy far, far away….”. It is even worse if we look at the situation in terms of real wages as the OBR forecast that it would be on target, so we see that real wage growth would be 3% per annum. Happy days indeed! But it was just an illusion. The scale of that illusion was illustrated by this from Geoff Tily of the Trade Union Congress or TUC earlier this week. So in the decade before the first TUC meeting in 1868, real wages had fallen by 0.1%. Since then, only the decade to 2018 has seen a worse performance, with real wages down by a whopping 4.4%. So rather than the sunlit uplands suggested by the OBR we have seen a much more grim reality. As an aside this brings us back to the problem of “experts”. In my opinion you deserve that label if you get things right, for example aircraft designers as air travel is very safe. Whereas official economics bodies are regularly wrong and therefore in spite of the lauding they get from the media do not deserve such a label. I also note that those who debate that issue with me and claim that it does not matter the forecasts are wrong (!) are often from the group that have hopes of gaining employment in this area. This morning has brought more news on wage growth in Japan but before we get to it we need to set the scene. This is because the land of the rising sun has been anything but in terms of wage growth. Or as Japan Macro Advisers put it. Wages in Japan has been steadily falling in Japan since 1998. Between 1997 and 2012, wages have declined by 12.5%, or by 0.9% per year on average. Japan has been the leader of the pack in a race nobody wants to win. It also provided a warning which has come in two guises. Firstly the concept of real wages falling in a first world industrialised country and secondly the very long period for which this has been sustained. This is one of the major players in the concept of the lost decade for Japan which in this regard has now lasted for two of them. This was a driver between the original claims for Abenomics where ending the deflationary mindset was supposed involve higher wage growth. In reality the performance is shown by the official real wage index which was set at 100 in 2015 and was 100.5 last year. So very little growth and in fact a reduction on the 101 of 2014. But hope springs eternal and we know that May and especially June were much better so here is Reuters on this morning’s release of the July data. Separate data showed Japanese workers’ inflation-adjusted real wages rose 0.4 percent in July from a year earlier, marking a third consecutive month of gains. What this tells us is that as the bonus season is passing the better phase was for bonuses and nor regular wages or salaries. So whilst the news is welcome it is not the new dawn that some have tried to present it as. Indeed tucked away in the Reuters report is a major issue in this area. firms remain wary of raising wages, despite reaping record profits. The link between companies doing well and wages rising in response has been broken for a while now. Earlier this week Japan Press Weekly was on the case. Finance Ministry statistics released on September 3 show that in 2017, large corporations with more than one billion yen in capital increased their internal reserves by 22.4 trillion yen to a record 425.8 trillion yen. Compared with the previous year, big businesses’ current profit was inflated by 4.8 trillion yen to 57.6 trillion yen, 2.3 times larger than that in 2012 when Prime Minister Abe made his comeback. The remuneration for each board member was 19.3 million yen a year, up 600,000 yen from a year earlier. Meanwhile, workers’ annual income stood at 5.75 million yen on average, down 54,000 yen from the previous year. The section about the rise in profits for big businesses under Abenomics resonates because the critique of his first term was exactly that. He benefited Japan Inc and big business. Later today we get the non farm payrolls release from the US telling us more about wage growth. But as we stand in spite of the fact the US economy has had a good 2018 so far the state of play is a familiar one. Real average hourly earnings decreased 0.2 percent, seasonally adjusted, from July 2017 to July 2018.
workweek resulted in a 0.1-percent increase in real average weekly earnings over this period. Indeed if we look back as Pew Research has done we see that real wage growth has been absent for some time. There have been gains in benefits but not wages over these times. The Czech National Bank has looked at this and we see an ever more familiar drumbeat. In the euro area, nominal wage growth was 1.7% in 2017 Q4, while real wages were broadly flat. This comes with factors you might expect ( Italy) but also I note Spain which is doing well. In Italy, by contrast, hourly wages dropped both in nominal terms and in real terms (i.e. adjusted for consumer price inflation). Spain and Austria also recorded wage decreases in real terms. Also they are not particularly optimistic looking forwards. However, the wage growth outlooks available for the euro area and especially for Germany do not see wages accelerating significantly any time soon. We could apply that much wider. The message today was explained by Bob Dylan many years ago. The truth is that the economics profession has been slow to realise that not only would the credit crunch reduce wage growth, but that it was already troubled. Only last night in a reply to a comment I referred to Deputy Governor Wilkins of the Bank of Canada spinning the same old song. Yet, wages were rising less quickly than we would expect in an economy that is near capacity. The same old “output gap” mantra when in fact the reality is of inflation at 3% and wages growth at 2.5%. To be fair some places do seem to be adjusting as the Czech National Bank faces up to an issue that the UK economics establishment continually assures us is not true. Migration from Eastern Europe, Italy and Spain,3 which has increased mainly because of the financial and debt crisis, is playing a major role. Workers from these countries are increasing the labour supply and perhaps exerting less upward pressure on wages than incumbents. ( They are referring to German wage growth). Some however seem to inhabit an entirely different universe as this op-ed from November last year in The Japan Times shows. Let me leave you with an optimistic thought. As I watched the AI documentaries on BBC Four this week I wondered if rather than fearing it we should have hopes for it. Maybe the rise of the machines will be fairer than our current overlords. One of the economic themes of these times has been the boom in asset prices caused by ultra easy monetary policy and the way that establishment’s present this as “wealth effects” leading to economic growth when in fact some and often much of this is in my opinion inflation. For example those investing in government bonds have benefited from rises in prices and this is presented as a “wealth effect” but on the other side of the coin someone taking out an annuity faces much lower yields and much lower income from a set sum. Yet the “wealth loss” for them is not counted. There is also the issue of house prices where again rises are presented as an economic benefit which for some they are but both first-time buyers and those wishing to trade up in the market face higher prices. The house price issue is one which has dogged economic comment about Canada and merited a substantial mention by the Bank of Canada last week. This is significant because central banks look away from such matters until they feel they have no other choice. The emphasis is mine. Housing activity has also been stronger than expected. We have incorporated some of this strength in a higher profile for residential investment, although we still anticipate slowing over the projection horizon. The current pace of activity in the Greater Toronto Area (GTA) and parts of the Golden Horseshoe region is unlikely to be sustainable, given fundamentals. That said, the contribution of the housing sector to growth this year has been revised up substantially. Price growth in the GTA has accelerated sharply in recent months, suggesting that speculative forces are at work. Governing Council sees stronger household spending as an upside risk to inflation in the short-term, but a downside risk over the longer term. What is happening to house prices in Toronto? Canada Statistics has an index for the price of new houses. On the strength of price increases for new houses in Toronto, the NHPI rose 3.3% over the 12-month period ending in February. This was the largest annual growth at the national level since June 2010. 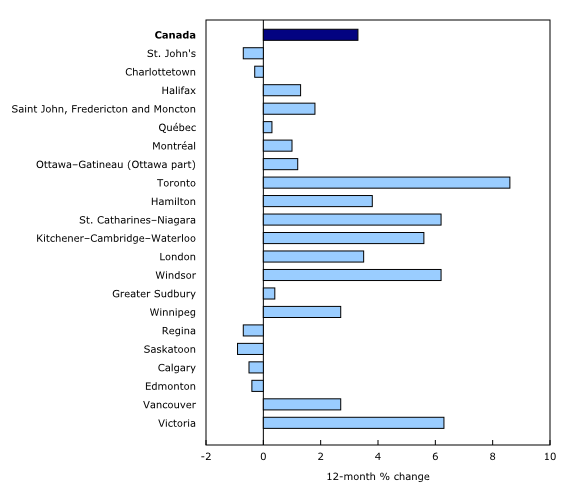 Toronto recorded an 8.6% year-over-year price increase, the largest among the metropolitan areas surveyed, followed by Victoria (+6.3%), St. Catharines-Niagara (+6.2%), and Windsor (+6.2%). The gain for Windsor was the largest reported since January 1990. Care is needed with such measures as for example the UK has hit trouble. So let us look further, the editorial of the Toronto Sun told us this yesterday. The Toronto Life has something that is even more eye-catching. Ah too high eh? Nope. The listing agents say they priced the house at what they thought was market value. Eight offers came in, after which the agents gave everyone the chance to improve. Seven did, and the sellers accepted the offer with the fewest conditions and best price, for more than $750,000 over asking. This may not have been a complete fluke: two other houses on Farnham Avenue have sold in the $2.5-million price range in the past year. You have to question the listing agents there of course but it is an interesting price for a house which is very smart inside but does not look anything special from the front. We do get perhaps more of a realistic perspective from yesterday’s “sale of the week” as we have a comparison. The sellers made the easy decision to go with the highest offer, at more than $400,000 over asking, $1,656,000. Yesterday the Royal LePage house price survey told us this. According to the Bank of Canada it is very expansionary or loose. If we maintain a straight face at the chutzpah and indeed fantasy that they know that to that degree of accuracy we can see that with an official interest-rate of 0.5% they are some 2.5% below neutral. If we look at the exchange-rate then there was another boost as the trade-weighted Loonie or CERI fell from the low 120s in 2011/12 to a low of 89 as 2016 opened. It then rallied a little and over the year from March 2016 has in fact started at 95 and ended there. There are two issues here that need to be noted. Firstly this is an effective exchange rate with an elephant in the room as the US Dollar is 76.2% of it! Secondly due to its plentiful stock of raw materials the currency is often at the mercy of commodity price movements. Moving to the money supply we see that the taps are open pretty wide. The broad measure has seen its annual rate of growth rise from the 4.5% of late 2010 to 7.7% in February of this year. There was a dip in narrow money growth in March but it is still increasing at an annual rate of 9%. Canada Statistics tells us this. Total household credit market debt (consumer credit, and mortgage and non-mortgage loans) reached $2,028.7 billion in the fourth quarter. Consumer credit was $596.5 billion, while mortgage debt stood at $1,329.6 billion. If we compare to incomes we see this. Household credit market debt as a proportion of adjusted household disposable income (excluding pension entitlements) edged up to 167.3% from 166.8% in the third quarter. In other words, there was $1.67 in credit market debt for every dollar of adjusted household disposable income. On the other side of the ledger that was something to please the Bank of Canada. National wealth, the value of non-financial assets in the Canadian economy, rose 1.4% to $9,920.0 billion at the end of the fourth quarter. The main contributors to growth were real estate and natural resources. The value of real estate grew by $93.0 billion while the value of natural resource wealth increased $29.4 billion. Although the rest of us will wonder how much of that $93 billion is from the Toronto area? There is a lot to consider here as whilst the word bubble is over used it is hard to avoid thinking of it as we look at Toronto and its housing market. If we look at wages growth it has been slowing from around 3% to 0..9% in Canada in terms of hourly wages so it is not any sort of driver. The price moves are if anything even more extreme than seen in London. A big factor is we see another place where foreign funds are flowing in and like in the other cases we are left to mull this from Transparency International. Transparency International Canada’s analysis of land title records found that nearly a half of the 100 most valuable residential properties in Greater Vancouver are held through structures that hide their beneficial owners. Canada is of course far from alone in such worries. Meanwhile the Bank of Canada finds itself not far off irrelevant which is awkward to say the least for a central planner. Of course where it is relevant it is making things worse. It was only on Monday that I discussed the issue of fiscal stimuli where the European Central Bank in particular had shifted its mood music in favour. This of course is quite a contrast to the policies it has enforced in Greece and Italy for example. The whole debate has come about because in the junkie culture world of monetary policy they are seeing a similar situation to what is happening with antibiotics where far from being futile resistance is ongoing. Thus they need a new drug and so fiscal policy has been brought out again. Yesterday saw an example of this in Canada as the new Liberal government of Justin Trudeau announced its Budget. There is a follow through to the UK because the Bank of England Governor Mark Carney had strong links with the Liberal party so strong in fact that they invoked criticism for an “independent” Governor of the Bank of Canada. First we got some Open Mouth Operations rhetoric and a dose of Hopium. Today, we begin to restore hope for the middle class. Who knew that things were so bad in a Canada that avoided much of the pain of the credit crunch via riding the commodity price boom as it resources industry cleaned up. Although of course just under 2 years ago the mood changed. The decline in the price of oil and other commodities has hurt whole regions and provinces. There was also a nod to a long running theme of this website. Wages haven’t grown significantly since the 1970s. It is rare that we get official admittals of that situation and we also get a suggestion that it might continue. It’s no surprise that many Canadians feel they are worse off than their parents were at the same age—and that they feel the next generation will do worse than their own. The speech itself was rather devoid of such details so let us turn towards the Financial Times. Justin Trudeau has pledged C$60bn (US$46bn) in new infrastructure spending over the next 10 years, hoping to revive sluggish growth in Canada’s resource-rich economy. It goes further with a suggestion of the economic benefits which might be provided by this. The finance minister forecast that the stimulus would raise gross domestic product 0.5 per cent in the coming year and 1 per cent in 2017-18, creating an estimated 100,000 jobs over two years. The particular winners were universities, green technologies, those with children ( Child Benefit increases), and poor pensioners. There are changes here as the proposed fiscal deficit of around Canadian $ 10 billion has been replaced by one of this below. According to the government the deficit would rapidly shrink. but pledged to cut the deficit in half by 2020-21. Rather oddly in the circumstances there was in the Budget speech something of a nod to the Fiscal Charter of UK Chancellor George Osborne. By the end of our first mandate, Canada’s debt‑to-GDP ratio will be lower than it is today. The track record of politicians making such statements is simply dreadful! However of course this cannot apply to Justin Trudeau who has only just taken office. Also the Canadian public finances are in better shape than those of the UK. The Fraser Institute summarised the numbers in January. Combined federal and provincial net debt has increased from $834 billion in 2007/08 to a projected $1.3 trillion in 2015/16. This combined debt equals 64.8% of the economy or $35,827 for every man, woman, and child living in Canada. Not quite as low as I was expecting but if we switch to the Statistics Canada numbers we see that central government owed Canadian $974 billion at the end of 2015 so like Spain a fair bit of borrowing is done at regional/provincial level. Canada like so many other nations can borrow cheaply as its ten-year yield is 1.33% so for the next decade or so any borrowing can be financed at low nominal interest-rates. Let me switch to an article in the Globe and Mail from Sherry Cooper of Dominion Lending Centres.. The housing industry is a strong feature of the Canadian economy right now. In fact so strong that we see this. I always enjoy this style of justification for a boom. As well, household balance sheets have improved over all as household wealth has grown faster than indebtedness. What she means is that house prices have risen so fast this has happened which of course hints at a trap as what happens if the growth stalls,ends or reverses? We get a clue from the Bank of Canada. Low interest rates and higher house prices have led to strong growth in mortgage credit, recently pushing up the year-over-year growth of overall household credit to 5 per cent. And more from Statistics Canada. The ratio of household credit market debt to disposable income (excluding pension entitlements) rose to 165.4% in the fourth quarter from 164.5% (revised from 163.7%) in the third quarter. In other words, households held $1.65 in credit market debt for every dollar of disposable income. Disposable income increased 0.6%, a slower pace than that of household credit market debt (+1.2%). So we find that rather like in Ireland if one was looking for a debt problem in Canada we are more likely to find it at the household and bank level than at the national one. The housing bust in Ireland socialised a large amount of this debt and turned a strong public fiscal position into a dreadful one pretty much overnight. So the risk for Canada is concentrated in the housing and banking sectors. If we look for the Why? of the fiscal stimulus then the Globe and Mail pretty much gave us the rationale. Unemployment, especially in the all-important energy sector, is reaching scary heights. Nationwide, the jobless rate hit a three-year high in February (7.3 per cent), and it could move higher. So Canada has seen the good side of moving contracyclically with the rest of the world and is now seeing the bad. Expected growth of 1.4% this year ( Bank of Canada) would do little if anything to change that and so you can see the case for fiscal policy which has so many advocates right now. Also for the forseeable future it is cheap in bond yield terms. The other side of the coin is what in Japan is called pork barrel politics or how well the money will be spent. Those who worry about official denials will note that one has been got in early. Ironically the Bank of England Underground Blog has just issued some research suggesting that it may not be all apple pie and sunny days. Second, we revisit the magnitude of the government spending multiplier at the ZLB to document that demand-side fiscal stimulus can be much weaker than previously thought. ZLB is the Zero Lower Bound for interest-rates which is the zone in which Canada is in at 0.5% albeit that they lower bound may get lower. Perhaps they should tell the international bodies cheerleading for a fiscal stimulus. as governments are being urged to do by everyone from the IMF to the OECD to the G20. Is that the same IMF that imposed a fiscal contraction on Greece, Ireland and Portugal or a different one? Remember this from 2013 when it admitted it had been wrong? Finally, it is worth emphasizing that deciding on the appropriate stance of fiscal policy requires much more than an assessment regarding the size of short-term fiscal multipliers. Thus, our results should not be construed as arguing for any specific fiscal policy stance in any specific country. In particular, the results do not imply that fiscal consolidation is undesirable. So let me leave the IMF singing along to Linkin Park. Why is Canada even discussing negative interest-rates? Yesterday there was quite a development in Toronto where Stephen Poloz the Governor of the Bank of Canada was speaking. Let me quote his words. The fourth unconventional monetary policy tool I want to cover is negative interest rates, which is something you have heard a lot more about recently. Not only recently Stephen as I have been discussing them on here since 2010! However the Bank of Canada does have a track record in this area so please join me in a trip in the TARDIS of Dr. Who back to April 2009 and the emphasis is mine. On 21 April, the Bank lowered its target for the overnight rate by one-quarter of a percentage point to 1/4 per cent, which the Bank judges to be the effective lower bound for that rate. We have been noting over the last 18 months or so that the “lower bound” has been slip sliding away especially as we note that every country which has implemented negative interest-rates has then cut them further. However there was a reason that the Bank of Canada thought that they were a bad idea in 2009. In principle, the Bank could lower the policy rate to zero. However, that would eliminate the incentive for lenders and borrowers to transact in markets, especially in the repo market. So if we translate that into ordinary persons English we see that like the Bank of England they were concerned about what zero interest-rates would do to the banking sector. It is always the banks for them isn’t it? Oh and the man signing off that report was called Mark Carney, whatever happened to him? A paper by two Bank of Canada economists ( Jonathan Witmer and Jing Yang) takes up the story. Our best estimate for the effective lower bound is a target rate of around -50 basis points (bps). So what has happened in the intervening six years or so which has changed their mind? Since investors must pay to store large amounts of cash, the effective yield on cash is actually negative…..Cash storage costs, including direct costs of storage and insurance costs, are approximately equivalent to 25 to 50 bps per year. I do like “must pay” as of course there is a choice which they miss. In reality there is a variety of choices where an ordinary person stuffing cash into either a literal or metaphorical mattress may consider the cost to be zero, or a drug dealer who will have very heavy costs laundering his cash. But the fundamental issue here is that none of this has changed in the past six years so why has the Bank of Canada? The absence of abnormal cash demand in Switzerland, for example, with the target rate at -75 bps, supports this possibility. Ah okay so they now think that they can get away with it without unduly harming the banking sector! Also I note that something we have discussed on here many times has been noted. In addition, many banks have not passed on the rate cut to mortgages. This may be due in part to the banks’ desire to protect their interest rate margin. So the central banks worried that negative interest-rates would hurt banks but now they discover they pass on the problem in the form of a rugby hospital pass and hurt the consumer their worries disappear. Ouch! Talk about revealing their motivation. This reminds me of the biggest Sham 69 hit where you need to replace kids with banks. If this was another industry failing to respond to downward price pressures by in effect forming a cartel would lead to investigation and prosecution but apparently different rules apply to banks. We do get a burst of genuine honesty towards the end of the paper. We do not know where exactly the ELB for the Bank of Canada policy rate is, nor do we know how long policy rates could stay negative. But also in case we missed it a reminder of the “by the banks for the banks theme” and the emphasis is mine. In such an environment, they should monitor the effect of negative rates on core funding markets, banks and other market participants. Oh and you might have thought that the real economy might have got a mention at least somewhere….. There are various issues here but Governor Poloz is either unaware of deliberately ignores the problem of proclaiming Forward Guidance and also telling people this. This suggests that we have more room to manoeuvre in response to adverse shocks than we believed back in 2009. So they were wrong about a basic point when giving Forward Guidance back then. Also in a world where confidence is fragile there is the issue of whether making such statements is damaging in itself. The human psyche can be mysterious and unpredictable and the same critique was applied to the former Bank of England Governor Baron King of Lothbury who was invariably downbeat. Will people worry about the downbeat implications and be afraid be very afraid or concentrate on this. In the Bank’s last Monetary Policy Report (MPR) in October, we forecast that the Canadian economy would return to positive growth in the second half of this year, and that annual growth would continue to increase in 2016 and 2017…..Canada’s outlook is encouraging. So the future is so bright we are considering negative interest-rates in response to it? Even Governor Poloz can spot the flaw. Given this outlook, it may seem like an odd time to be updating our unconventional monetary policy tool kit. The lower bound has been a very troubled area for the Bank of England Governor. Yesterday saw his Forward Guidance of 0.25% become -0.5% in Canada. Even worse for him he actually raised his estimate of the lower bound in the UK to 0.5%! Up was the new down for him and his behaviour was even odder because he did this as places in Europe were heading into negative interest-rate territory. He is lost in his own land of confusion on this subject. The issue of the spread and indeed contagion of negative interest-rates is one that makes appearances in what might seem unexpected places. If pressed about this week I would have guessed Sweden,Denmark or Switzerland would be making the headlines. Also Canada had for a long time a relatively good credit crunch as the commodity price boom meant the problems seen elsewhere were underwritten. Along the way we saw “Peak Carney” as the UK establishment were seduced by such events and he saw a chance for personal improvement. However now for all the rhetoric there are plainly issues as we note an oil price where the Brent Crude has tested US $40 more than once already this week. In addition the Bloomberg Commodity Index hit a low for this century. This led Governor Poloz to mull on these possibilities. commodity prices could fall further as new supply weighs on prices…….even as the resource sector contends with lower prices. We do not know what will happen next but we do know that it recent days the resource sector has seen even lower prices. A Black Swan for the previously serene Canada? As we stand the situation remains relatively serene as the last GDP report showed annual growth of 2.3% albeit with a 0.5% fall in September. However employment has dipped in the last 2 months as we wonder if Canada can continue to escape the pain that others have suffered in the credit crunch era? The currency has certainly got the message. From the Financial Times. What is happening to first world manufacturing? The last 24 hours or so have given us a few reminders of the ongoing problems that world manufacturing faces. This also reminds us of the shift that has taken place over time from businesses which make things which are clearly measurable such as cars and white goods to those in the service sector where output is more ephemeral and consequently more difficult and so far sometimes impossible to measure. One side-effect of this trend especially if we look at the virtual world is that output for numbers such as Gross Domestic Product becomes even harder to measure with any hope of accuracy. UK readers may be having a wry smile at the concept because they have been subject to a barrage of official rhetoric in the opposite direction. This began with the “rebalancing” claims of the former Bank of England Governor Mervyn King and more latterly the current Chancellor George Osborne coined the phrase “march of the makers”. These Open Mouth Operations have found themselves filed under a sub-section of “never believe anything until it is officially denied”. Yesterday came news which made quite a few people sit up and listen. From the Institute of Supply Management. Okay so let us take a look at the detail of this. “The November PMI® registered 48.6 percent, a decrease of 1.5 percentage points from the October reading of 50.1 percent. The New Orders Index registered 48.9 percent, a decrease of 4 percentage points from the reading of 52.9 percent in October. The Production Index registered 49.2 percent, 3.7 percentage points below the October reading of 52.9 percent. So we see a lower number and if we look forwards it is hard to avoid the thought that prospects are not good if you note the substantial fall recorded in new orders. You may be wondering about the positive car sales numbers which were also released? Well they seem to have been included here “Automotive remains strong.” Also I note that the import quotient was up which will provoke thoughts of the likely impact of the stronger dollar. Readers and the US Federal Reserve (with its interest-rate rise hints and promises) will be mulling the overall impact of this and ISM has a go itself. In addition, if the PMI® for November (48.6 percent) is annualized, it corresponds to a 1.7 percent increase in real GDP annually. That raises a wry smile as they are also proclaiming the decline of manufacturing as the clear implication is that the economy grows in spite of it shrinking. According to them it still grows down to 43.6 on the manufacturing ISM scale. They are not quite aligned with the Atlanta Fed GDP nowcast. The GDPNow model forecast for real GDP growth (seasonally adjusted annual rate) in the fourth quarter of 2015 is 1.4 percent on December 1, down from 1.8 percent on November 25. Will the overall Federal Reserve be singing along to 10cc on December 16th? The irony is that the official US manufacturing figures had been better recently after a weak start to 2015. The 1% rise in July made a decent third quarter and October saw a 0.4% rise. But of course the July numbers were accompanied by this bombshell. The rates of increase in manufacturing from 2011 through the first half of 2015 are now lower than reported earlier, particularly for 2012 and 2013, the years for which the majority of benchmark data became available. The downwards revisions exclude some high-tech industries where the numbers are oddly troubled and reduced 2012 by 1.7%, 2013 by 1.6% and 2014 by 0.5%. They also implied the full data set for 2014 was not yet in, begging the question if it might also see a more substantial revision. Also we have to allow for this. The base year for IP was advanced from 2007 to 2012, which raised the level of the index in all periods. Do not misunderstand me there has been a recovery in US manufacturing but it is not the poster boy/girl people thought it was and we have had a hint it may be slowing. This has been a news story for 2015 so let me just pick out a highlight from yesterday’s Markit purchasing manager’s index report. The health of the sector has now worsened in each of the past nine months. However, the latest deterioration was the weakest seen since June. They report a stabilisation but with their measure at 48.6 then a mild contraction is being reported. This is of course at odds with the official numbers but seems to be confirmed with other information such as shipping data and commodity prices. Yesterday’s GDP data was a curates egg and you can choose the monthly fall of 0.5% or the annual rise of 2.3%. However there was also this. Manufacturing output decreased 0.6% in September, after three consecutive monthly gains. This made it some 0.9% lower than a year before and backs up this from the earlier manufacturing release. Constant dollar manufacturing sales were down 1.6%, indicating that the volume of goods sold was lower in September. The good news for the land “down under” this morning was that GDP rose by 0.9% on a quarterly basis driven by net exports being up by the equivalent of 1.5% of GDP. But even here we see this. Manufacturing (-0.1 percentage points) was the largest detractor in trend terms. (annual numbers and effect on GDP). In terms of comparison with a year ago manufacturing was down by 0.9%. The mood music from the UK’s own PMI survey for manufacturing was good yesterday albeit not as good as the previous month. The UK manufacturing sector maintained its positive start to the final quarter, with November seeing growth ease only moderately from the recent peak attained in the prior survey month. Okay but of course the picture here has been troubled. as it starts to reverse the losses sustained in the prior quarter……it positions manufacturing as less of a drag on the broader economy. Less of a drag is hardly “march of the makers” territory is it? The official numbers were good if we look back a year or so ago but now we have this. Manufacturing, the largest component of production, is estimated to have decreased by 0.4% between Quarter 2 (Apr to June) 2015 and Quarter 3 (July to Sep) 2015. So if we have a solid final quarter will we simply be back to where we were at the half-way point of 2015? This provides a reminder of how far away we are from regaining the previous peaks. In the 3 months to September 2015, production and manufacturing were 9.3% and 6.4% respectively below their figures reached in the pre-downturn GDP peak in Quarter 1 (Jan to Mar) 2008. One section that seems set never to do so is steel production after the recent news. Looking at the underlying index we are at 101.7 where 2012=100 or the UK economic boom has bypassed manufacturing by. There are all sorts of issues to consider here. In the first world we have not only had relative decline in manufacturing we have also often had absolute declines as well and my home country is on both lists. We are becoming ever more a service economy in the UK and that trend seems to be on the march in plenty of places. As there is a limit to the goods that can be produced I guess that was always going to be a consequence of economic growth and development. But following the credit crunch impact which hammered manufacturing output we are also seeing issues in what are recorded as much better times. Has in some way the QE era contributed here? There are factors to account for as there will have been a depressionary impact on manufacturing from lower oil and commodity prices. For example numbers in the UK,US and Canada will have been affected by lower oil and gas prices in particular especially in the shale sector. But then of course you have to subtract their upwards influence in 2012,13 and early 2014 as well! Also the latest numbers from Australia record a boost in mining output which is quite a triumph when you look at the prices received. Some of this is no doubt a shift to countries with cheaper labour forces but there seems to be a bit of a tectonic plate shift as well. Or as my Dire Straits musical reference of October 7th put it. What are savers supposed to do in a world of continual interest-rate cuts? Early this morning saw yet another official interest-rate cut from a central bank. If we skip to a world down under we saw this from the Reserve Bank of Australia. So even Australia which has benefited from the resources based boom has joined the club which reduces interest-rates to all-time lows. I doubt it will be their last move in what is also a familiar theme and trend of these times. Also I note that it is not just short-term official interest rates which have gone down. Financial conditions are very accommodative globally, with long-term borrowing rates for several major sovereigns reaching new all-time lows over recent months……. overall financing costs for creditworthy borrowers remain remarkably low. This morning the ten-year bond yield in Australia has fallen to a record low of 2.36% as a bass line is added to the drumbeat. One of the issues here is that it is as we have discussed before become something of a South China Territories but even this has only protected it from the cold winds of interest-rate cuts for a period. In what is looking like something of a post colonial theme it was only yesterday that I was discussing the recent interest-rate cut in Canada. The Bank of Canada today announced that it is lowering its target for the overnight rate by one-quarter of one percentage point to 3/4 per cent. In another development the interest-rate which comes from a low-level of only 1% was in spite of the fact that the official forecast was for growth. The oil price shock is occurring against a backdrop of solid and more broadly-based growth in Canada in recent quarters. So even a relatively strong economy-so far anyway- only had an interest-rate peak of 1%? A new tactic in the interest-rate elimination wars came from the Riksbank of Sweden last year. The Board is cutting the repo rate by 0.25 percentage points to zero per cent, and making a significant downward revision to the repo-rate path. So we saw the Riksbank literally begin a Zero Interest-Rate Policy or ZIRP as its rate was cut to 0% but take a look at the rationale! In Sweden, economic activity is continuing to improve, primarily driven by good growth in household consumption and housing investment……….. The labour market will continue to strengthen in the years ahead and there will be a clear fall in unemployment. You are permitted an Eh? At this point. Some improving economic activity combined with an improving labour market makes a case for an interest-rate cut? It used to be the foundations for an interest-rate rise as savers feel a chill in their bones at the implications of this. If we continual the post colonial link we see that there was a case for another interest-rate rise in New Zealand. Annual economic growth in New Zealand is above 3 percent, supported by rising construction activity and household incomes. The housing market is showing signs of picking up, particularly in Auckland. But it did not happen partly because of all the interest-rate cuts elsewhere and fears of a currency appreciation. This of course begs the question of when an interest-rate rise can be made these days? These are increasing prevalent especially around the Euro area as linked economies try not to be affected by its travails and groundwash. I have analysed the way that the Swiss National Bank planned to cut to -0.25% and ended up cutting to-0.75% as the former proved insufficient. Next came Denmark’s Nationalbanken which learned nothing from Switzerland and ended up pretty much copy-catting it as it did this. At the same time we have seen the development and spread of negative bond yields which has been driven at least partly by negative official rates. Banks have been trying to avoid the negative rates at the central bank and so they have bought short-dated bonds instead which has often pushed yields negative there too. Danish and Swiss yields are negative quite a long way up their yield curves which leaves a saver with fewer and fewer alternatives. Also so far I have not pointed out that the European Central Bank went over to the dark side a while ago and has an official interest-rate of -0.2%. It also now has a litany of countries with negative bond yields and some of these are no longer so short-term as in Germany even the five-year maturity is negative. We do not have negative interest-rates but we have had an “emergency” Base Rate of 0.5% for what feels like “forever,ever,ever” as Taylor Swift put it but is in fact since 2008. What we have had is downwards pressure on savings rates from the policies of the Bank of England as it has operated several implicit bank bailout policies. Whilst the largest policy was the £375 billion of QE (Quantitative Easing) it was the Funding for Lending Scheme which provided banks with cheap funding reducing their reliance on savers to provide them with liquidity and cash. So from the summer of 2012 even more downwards pressure was applied to savings rates as we are reminded of the words of the hapless Bank of England Deputy Governor Charlie Bean. From Channel 4. I think it needs to be said that savers shouldn’t necessarily expect to be able to live just off their income in times when interest rates are low. It may make sense for them to eat into their capital a bit. In a move that makes him now seem a right Charlie he offered hope for the future and please remember this was September 2010! It’s very much swings and roundabouts. At the current juncture, savers might be suffering as a result of bank rate being at low levels but there will be times in the future as there have been times in the past when they will be doing very well out of the fact that interest rates are at a relatively high level and I think that’s something that savers should bear in mind. Savers may well be wondering when the next roundabout is?! By contrast Mr.Bean did not have to dip into his pension which rose and rose to an index-linked £119,200 per annum. What about UK savings rates? Swanlow Park have produced some annual averages which sing along to Alicia Keys. In 2008 they calculated the average rate as 5.09%, these following the Base Rate cuts and we saw around 2.8% in 2010-12. But following the Funding for (Mortgage) Lending Scheme we saw 1.75% in 2013 and 1.48% in 2014 as the new push from the Bank of England impacted on savers one more time. Indeed savers might quite reasonably think that this from Status Quo applies. Or of course there is. There are several issues to consider here of which the first is simple fairness. How long in a democracy can one-sided policies continue which benefit borrowers at the expense of savers? However there is an economic impact too which is that such Keynesian style policies have a time limit i.e they change things for a period and by the time that is up then the situation is supposed to be different as in better. The catch is that at best we are now singing along with Muse. Actually it is my opinion that it ran out some time ago and central banks are going back to the same play-book because they combine desperation with a lack of imagination. But whilst some (US Federal Reserve and the Bank of England) tease us with talk of interest-rate rises none have actually arrived and I note that the ECB tried it and now has negative interest-rates. So savers continue to be in the chill of what feels like a nuclear winter as I wonder if it will be followed by even more fall-out? After all the current disinflationary trends allow central bankers to talk of rising real interest-rates for a while at least.